In the photograph to the left, the variable resistor typically used for volume controls can be seen on the far right. Its value is very easy to adjust. The four resistors at the center of the photograph are the semi-fixed type. These ones are mounted on the printed circuit board. The two resistors on the left are the trimmer potentiometers. This symbol is used to indicate a variable resistor in a circuit diagram. There are three ways in which a variable resistor's value can change according to the rotation angle of its axis. When type 'A' rotates clockwise, at first, the resistance value changes slowly and then in the second half of its axis, it changes very quickly. The 'A' type variable resistor is typically used for the volume control of a radio, for example. It is well suited to adjust a low sound subtly. It suits the characteristics of the ear. The ear hears low sound changes well, but isn't as sensitive to small changes in loud sounds. A larger change is needed as the volume is increased. 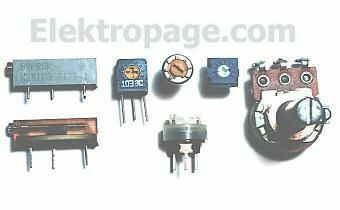 These 'A' type variable resistors are sometimes called 'audio taper' potentiometers. As for type 'B', the rotation of the axis and the change of the resistance value are directly related. The rate of change is the same, or linear, throughout the sweep of the axis. This type suits a resistance value adjustment in a circuit, a balance circuit and so on. They are sometimes called 'linear taper' potentiometers. Type 'C' changes exactly the opposite way to type 'A'. In the early stages of the rotation of the axis, the resistance value changes rapidly, and in the second half, the change occurs more slowly. This type isn't too much used. It is a special use. As for the variable resistor, most are type 'A' or type 'B'. Some components can change resistance value by changes in the amount of light hitting them. One type is the Cadmium Sulfide Photocell. (Cd) The more light that hits it, the smaller its resistance value becomes. There are many types of these devices. They vary according to light sensitivity, size, resistance value etc. Pictured at the left is a typical CDS photocell. Its diameter is 8 mm, 4 mm high, with a cylinder form. When bright light is hitting it, the value is about 200 ohms, and when in the dark, the resistance value is about 2M ohms. This device is using for the head lamp illumination confirmation device of the car, for example.